Where and when is the Air Force Marathon? T he 2019 Air Force Marathon, Half Marathon and 10K will be held on Saturday, September 21, 2019. The Start and Finish Lines are at the National Museum of the United States Air Force, 1100 Spaatz Street, Wright-Patterson Air Force Base, Ohio 45433. Start Time for the 10K is 6:30 a.m. Start Time for the Wheeled Division Full Marathon Race is 7:25 a.m. The Full Marathon and Half Marathon both start at 7:30 a.m. The 5K Race hosted by Wright State University is held on Friday, September 20, 2019. 5K bibs must be picked up before 6 p.m. at the expo. Start time is 6:30 p.m. at the Setzer Pavilion. The Start and Finish line are at Wright State University’s Nutter Center, 3640 Colonel Glenn Highway, Dayton, Ohio 45435. All runners will be required to pick up their bib, T-shirt, and goodie bag at the Sports & Fitness Expo at Wright State University’s Nutter Center on Thursday, September 19, or on Friday, September 20. There will be no runner registration or bib pickup on Saturday, September 21, 2019. *NOTE: A picture ID is required and we encourage you to know your bib number. How early should I arrive at the race venue? Earlier is always better! We suggest that runners arrive at the start line located at the National Museum of the United States Air Force at least one and one half hours before the scheduled start of their race as traffic can back up quickly. 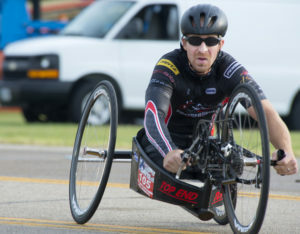 Start Time for the Wheeled Division Race is 7:25 a.m. and the start time for the Full Marathon and Half Marathon is 7:30 a.m. The 10K starts at 6:30 a.m. The 5K race on September 20, 2019 will be held at Wright State University’s Nutter Center. The Air Force Marathon Sports & Fitness Expo, where runners pick up their bibs, is held at this location as well, and it can become very congested. We suggest arriving early. Is there an age limit to be eligible to run the full marathon? Yes. You must be 16 years of age prior to September 21, 2019 to be eligible to register for the full marathon. Parent or guardian permission is required for minors. Where do I pick up my bib and goodie bag and what do I need? Can my friend pick up my race bib for me? Due to security reasons, we ask that runners make every effort to pick up their own race bibs at the Sports and Fitness Expo. Runners who are not able to pick up their bibs in person must make arrangements for a representative to pick up their bibs. Your representative must present a copy of your photo ID and a 2019 Bib Pickup Authorization from you in order to claim your race bib and goodie bag. The form and the copy of ID must be hard copy. No electronic copies (i.e. cell phone pictures) will be accepted. Is the Air Force Marathon open to the public? Yes, absolutely! Roughly 60% of our participants are civilians. Is there on-site parking at the Air Force Marathon? 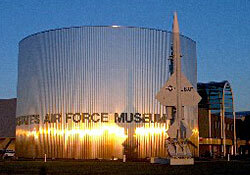 There is on-site parking 1 mile from the start line at the National Museum of the U.S. Air Force. Where can I drop off a runner? On Saturday morning, runner shuttle buses will begin leaving the Wright State University Nutter Center at 4:30 a.m. Buses will run every 5 minutes until 6:00 a.m. You can drop off runners at the Nutter Center and meet them at the finish line later to avoid the early morning traffic or pick them back up at the Nutter Center later. Return shuttle service to Wright State University’s Nutter Center will pick up in the National Museum of the United States Air Force parking lot starting at 9:00 a.m. and continuing until 2:00 p.m. PLEASE NOTE: Buses are for RUNNERS ONLY and your race bib must be visible. Spectators and family members will not be allowed to board the runner shuttles. Can I get dropped off at the museum? All 3 gates will be entry only. Gates will not open for exiting until 7:30 a.m. There will be no runner drop-off allowed at the museum. Any car entering through the gates should plan on staying on the museum grounds until 7:30 a.m. or later when the gates will open to exiting traffic. What if I am coming to the museum to pick up a runner? Enter through the museum gate on Springfield Street after 8 a.m. to pick up a runner. Is the Air Force Marathon walker friendly? All of our events including the full Marathon, half Marathon, 10K and 5K are walker friendly. We ask those of you who are going to be walking the full marathon, half marathon and 10K to start in the back.Please remember that you must finish by the course time limits – full marathon has a 7 hour time limit and the half marathon has a 6 hour limit. All time limits are based on gun time, NOT when a runner crosses the start line. Full marathon participants must maintain a 16 minute mile pace and reach Mile 21 (Gate 15A) by 1:05pm or they will be escorted off the course and will not receive a finishers medal. Is the Air Force Marathon a USA Track and Field certified course? The Air Force Marathon is certified by the USA Track and Field Association. The Air Force Marathon is a Boston Marathon qualifying run. Qualifying times for the Boston Marathon can be viewed at http://www.bostonmarathon.org/BostonMarathon/Qualifying.asp. Our office will submit all appropriate information to the Boston Marathon. Who receives a finisher’s medal? Every individual who crosses the finish line within the time limit will receive a finisher’s medallion, including participants in the marathon, half marathon, 10K, and 5K. There will be 244 porta-potties located at the Start Line. Each hydration station will have a minimum of 3, with some having as many as 10 depending on the number of runners expected to pass by. All races will take place rain or shine. In the event of extreme weather, routes may be altered. Races will be cancelled only if absolutely necessary for the safety of participants, volunteers and event staff. In this case, there will be no refunds of race entry fees. Each athlete must accept any such risk. We encourage you to check our web site and app throughout the weekend for the latest information. How do I switch from a longer race to a shorter race? Runners may transfer their registration to a shorter race if there are slots available. Go to the main registration page, sign in with the email and password you used to register, and click ‘Transfer’ on the left-hand menu bar to initiate your transfer before the event sells out. You must pay the difference on the rate published (if any) on the date the change is completed, plus a $10 transfer fee. How do I switch from a shorter race to a longer race? Runners may transfer their registration to a longer race if there are slots available. Go to the main registration page, sign in with the email and password you used to register, and click ‘Transfer’ on the left-hand menu bar to initiate your transfer before the event sells out. You must pay the difference on the rate published (if any) on the date the change is completed, plus a $10 transfer fee. Yes, credit cards are accepted for all races. Can I register and pick up my race bib on race day? No. We do not allow race registration or race bib pick up on race day (Saturday) for the full and half marathons or 10K race. 5K participants may pick up their bib on Thursday, or Friday before 6 p.m. Registration fees are non-refundable, even in the event of race cancellation. The only exception is for official military deployment (CED Orders). Refunds WILL NOT be given for TDY or PCS orders. If you have already registered and can no longer run, you may defer your registration to the following year. How do I defer my 2019 registration to 2020? Fill out the form and complete the transaction. There is a $15 fee for all deferrals. No, there is no option for transferring registration to a new participant. If you have already registered and can no longer run, you may defer your registration to the following year. How long do I have to complete the course when I run the marathon, half marathon or 10K? All runners must finish the full marathon within the 7 hour time limit in order to receive an official time and a finisher’s medal. For your own health and safety, the 7-hour limit will be strictly adhered to and there will be no exceptions. Full marathon participants must maintain a 16 minute mile pace and reach Mile 21 (Gate 15A) by 1:05 pm or they will be escorted off the course and will not receive a finishers medal or an official time. Half marathon participants have 6 hours. If participants are not keeping pace during the race, they will be asked to leave the course and transported back to the finish line area. All time limits are based on gun time, NOT when an individual runner crosses the start line. Will there be medical stations available on the course and will they have doctors? Yes, there will be 9 stations on the course. Medical support for this event will consist of primarily volunteer medical personnel prepared to administer first aid-style assistance along the race course and at the finish line. What is your refund policy for military members who are deployed? See Also: For more information visit Active Duty. – Refunds WILL NOT be given for TDY or PCS orders. – Refund needs to be requested before the end of September. Permissive TDY is authorized for Air Force active duty members under AFI 36-3003 (11 May 16) Military Leave Program, Chapter 4, Paragraph 4.2.3, Table 4.5, Rule 12. Be sure to check with your supervisor. In accordance with Joint Travel Regulations, DoD guidance and AF Instructions, civilians cannot be granted permissive TDY to participate in the Air Force Marathon. For more information please contact HQ AFMC/A1SXA at (937) 257-4803, (937) 257-4803 or DSN 787-4803. Is Permissive TDY authorized for Air National Guard Members? According to AFI 36-3003, for the permissive TDY rules to apply, the ANG or Reserve member must be on active duty status. This must be approved by the Unit Commander. (This publication addresses leave, passes, and permissive temporary duty (PTDY) for military members. It applies to active duty personnel, including United States Air Force Reserve (USAFR) on active duty. It also applies to Air National Guard (ANG) members serving on active duty in Guard or Reserve status under the provisions of Titles 10 or 32 United States Code (U.S.C.) for 30 or more consecutive days. It implements Air Force Policy Directive 36-30, Military Entitlements, and DoD Directive 1327.5, Leave and Liberty, September 24, 1985, with changes 1-4). Can you tell me more about the MAJCOM Air Force Marathon/Half Marathon Challenge? Yes – more than 2,400 volunteers are needed in order to have a successful event. Volunteer registration opens May 1, 2019 and will close Aug 31, 2019.